Lake Eola provides the perfect spot to grab some food and relax on a cool Sunday. Okay, I'll admit I've definitely been to the Orlando Farmers Market before, but before you accuse me of already breaking my resolution to try new things already, it's been like two years since I've been. That basically means it's a new market right? Not exactly. But it's great to see so many local vendors are still thriving with their businesses. Plus, I made it a point to stop by some new vendors and try some new things. Creative and colorful there were no shortage of clever signs promoting female empowerment. Although this picture doesnt show it, there were a surprising amount of men present and reppin for the cause. 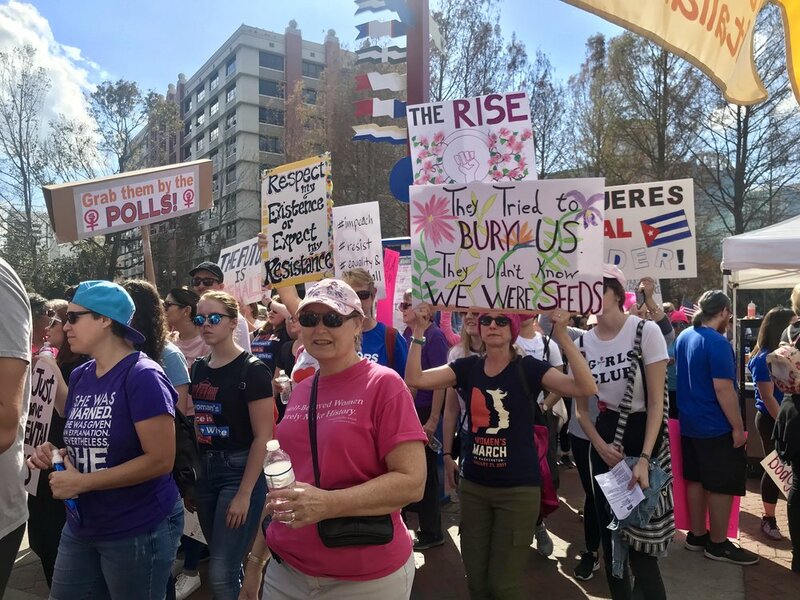 The Sunday I visited the market on was different from most others because there was a Women's Rally going on in observance worldwide Women's March protest. Not that the farmers market isn't fun on its own but having triple the bodies in the area, energized for an important cause, made for an especially lively outing. In my past trips I have always jealously eyed passerbys as they Instagramed their Green Tea Mojitos served by Cubanoz , but for some reason never actually tried one. They sell the concoction in one size for $5 and let me tell you – it's worth it. Give them your money. Super refreshing, not too sweet (cannot emphasize enough how this won me over) and a generous portion. Although the weather was cool and beautiful on the day I went, I can see how this can be a lifesaver on a hot summer day. As I'm writing this, I'm kinda bummed I don't have one now. Cubanoz also offers traditional Cuban sandwiches and coffee if you're looking for something more substantial to fill up on. I think my awkward inability to properly hold the cup is a good indicator that the serving size is giant. Although this isn't new to me, I also had OverRice FoodTruck's Huli Huli Chicken Lunch Plate for $10. OverRice is a Filipino and Hawaiian fusion eatery that I am super happy is still doing their thing. Your order comes with your choice of meat(s), jasmine rice, pancit (stir-fried noodles), and lumpia shanghai (spring roll). I love that the chicken is so moist and flavorful with ginger-soy sauce. I'm not a huge eater so OverRice's serving can actually feed me twice. Whether you're a heavy or light eater, I highly recommend you try this spot. There are also pork dishes if chicken isn't your thing. As for retail vendors, Clockwork Alley's shop caught my eye. If you love the steampunk aesthetic this is a vendor for you. I'm usually not a big fan of this style, so the fact I actually liked a lot of their stuff must mean something, right? 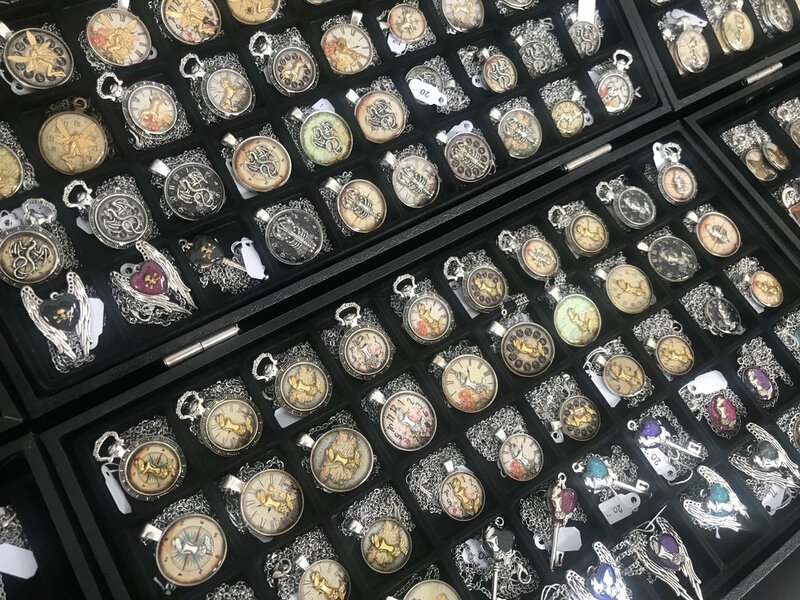 There's a huuuuge variety of necklaces, rings, earrings and other trinkets here that make for a great present for a loved one or treat for yourself. Lorry Volkens makes all the items herself and began making jewelry like this after repurposing a handed-down and broken watch from her grandmother. If you want to see more of Clockwork Alley's items, check out their Etsy linked to the above. Lorry and husband run their shop together and moved down to Florida from Connecticut. They both pointed out something I never really considered as a native Floridian. We are so blessed to have warm-weather and sunshine most of the year. For Northerners, farmers markets like this don't exist because it's too cold for anyone to be wandering around outside. For you locals reading this, take advantage! If you can't make it to Lake Eola on a Sunday there's the College Park Farmer's Market on the same day and the Winter Park and Winter Garden Farmer's Markets on Saturdays.